This tutorial explains how to create undeletable folder in Windows 10. When a folder is undeletable, then all the delete options (right-click context menu), Del, and Shift+Del, etc., won’t work for that particular folder. Apart from that, rename option also won’t work for that undeletable folder. This can be done with different methods. Do note creating an undeletable folder doesn’t mean it can’t be deleted forever. You can do changes so that it can be deleted later whenever you want. To make an undeletable folder in Windows 10, I have covered a free software and two built-in options for Windows 10. First two methods help you create special or forbidden folders with name Con, Com, Lpt, etc., and the last method let you protect any folder by adding changes to security permissions of a folder. This tutorial has added all steps for all the available methods. Let’s see these methods to create undeletable folder one by one. Method 1: How To Create Undeletable Folder Using Command Prompt Window? 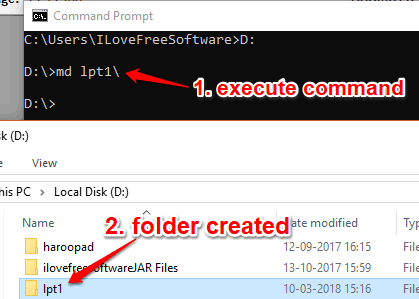 If you don’t want to use Command Prompt and follow some other process, then this method is simply awesome to create an undeletable folder. 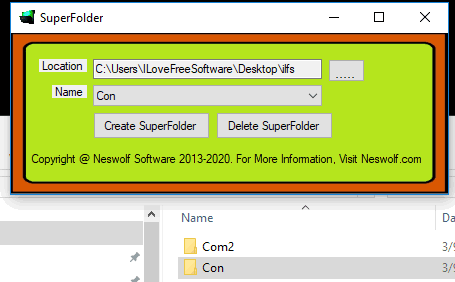 This free “SuperFolder” software let you create different special folders like Con, Pm, Com3, Com4, Lpt1, lpt2, lpt3, etc. You can also delete any undeletable folder created using this software. Step 1: Click here to download the zip file of SuperFolder software. This software also requires Visual Basic PowerPacks 10.0 to run successfully. So, you must install that software. After that, extract the zip file and then run the setup of SuperFolder. Step 2: Open its interface which is very simple. You need to select a location or folder where you want to create the undeletable folder. After adding the location, select a name for that folder from the list. As I mentioned above, it lets you create an undeletable folder with name like Con, Con2, Com3, Lpt2, etc. Select a name from the drop-down menu. Step 3: When the name is set, click the “Create SuperFolder” button. That’s it! The software will immediately create the undeletable folder. Now try to rename or delete it and you will find that it’s not happening. Step 4: To delete the undeletable folder created with this software, you can add folder location on its interface, set folder name, and then use Delete SuperFolder button. You may also read the full review of SuperFolder here. Method 2: How To Make Undeletable Folder Using Command Prompt Window? Command Prompt method to make an undeletable folder is also simple. The only thing is you can’t create an undeletable folder where Windows is installed. So, you need to select some other hard drive like ‘D’ or ‘E’. 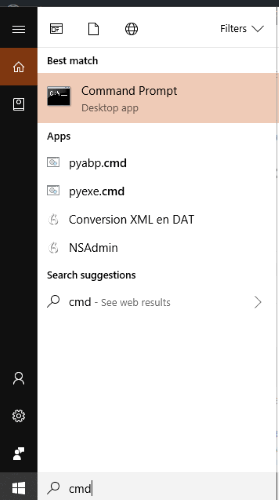 Step 1: Type cmd in the Search box and then you can open Command Prompt window. Step 2: Now change the path to some other hard drive. So, you can add “D:“, “E:” or any other drive letter and press Enter. Step 3: Use this command to create a Con, Lpt, or another folder which can’t be deleted: “md foldername\“. Replace foldername with Con, lpt, Com, etc. So, the command would be: “md Con\“. Execute the command and access that hard drive. You will see that undeletable folder is created. Step 4: To delete the same folder, first delete all files from that folder using the delete option(s) of Windows. Now you need to follow step 1 and 2, and in step 3, your command would be: rd foldername\. Again, replace foldername with actual name of folder. So, the full command would be: rd lpt1\. Execute the command and it will delete that folder. 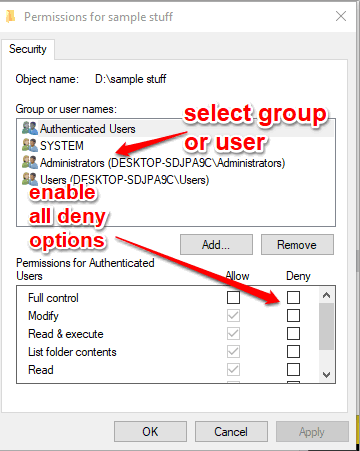 Method 3: How To Create An Undeletable Folder Using Security Permissions of A Particular Folder? This method is helpful to make any folder undeletable. You can either create a new folder or make an existing folder undeletable. 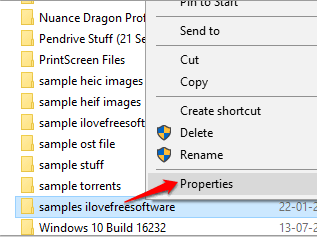 Step 1: Right-click on a folder and click on “Properties” option. Step 2: Access the Security tab and then click on “Edit” button. It will open another window. Step 3: Now select a group or user name for which you want to make the folder undeletable. You can also select all the groups or users one by one and set the protection. Once a group/user is selected, select all Deny options for that particular group/user, apply the changes by confirming them and save them. This will make the folder undeletable. Later, when you want to rename or delete that folder, you can change folder permissions manually or with some software and then delete it. So, these are some interesting ways to create undeletable folder in Windows 10. I guess all methods are good in what they offer. Still, the first method is handy to create different types of special folders easily than method 2. And method 3 is handy to protect an already available folder. So, based on your requirements, you can go with any method that suits your requirements.